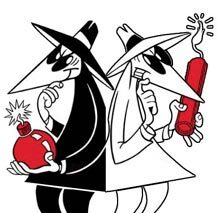 Two spies walk into a bar. And I'm sorry, but your security clearance isn't high enough to hear the rest of the joke. Let's see you come up with a good joke then. Go ahead. I'll wait. Before I go any farther, let me provide the answer to yesterdays Made Up Monday. It's true. 100% entirely true. My Source? Cookie Monster himself. In 2004 on an episode of Sesame Street, Cookie Monster shows a photo album of himself as a baby. One of the pictures is of the first day he ate a cookie. "Me was just a mild-mannered little kid. In fact, back then, me think me name was Sid. Yeah, yeah." "Me wasn't born with name 'Cookie Monster'. It just nickname dat stuck. Me don't remember me real name... maybe it was Sidney?" So yes, in fact, Cookie Monster is his job title, and his name is Sid. Back to todays post and why there is a picture of Spy VS Spy up there. Let's go back in history. You may remember a few weeks ago I told you about Garbo. A famous double agent working for the allies. Today I am going to tell you a much shorter story about another spy, but from a different war. He wasn't nearly as good as Garbo was. In fact, he was down't right ineffective for his side. Not much is know about this man. In fact, I couldn't even find a picture of him to post at the beginning of the article. But the story you are about to read, while comically tragic, and tragically short, is true. His name was Peter Karpin. He was enlisted and trained by the German intelligence agency to spy n France after the outbreak of hostilities in World War I. After his training, he was sent to France. Where he was captured as soon as he crossed the border. The French, however, kept his capture a secret. Using his code name and his code books, they sent false information to the Germans. And they took in all the information the Germans sent back. Like new codes. The French even cashed his paychecks. Thinking it would be ironic, they used the money the Germans sent Karpin to but an automobile for the military to use. Everything was going great until 1917, when Karpin managed to escape and make his way back to Germany. He was, of course, immediately fired from his intelligence job. But since he had been a prisoner of the French, he also wasn't suited for military service. So he moved to a new town and faded into obscurity. After the war, in 1919, the car that was purchased with Karpins money was driving around the French occupied, German Ruhr Valley. There was a terrible accident, and a pedestrian was killed.